I have started a new thing. It encompasses all I love: scrapbooking, journaling, drawing, painting, mixed media, smash books, etc. So, had to share my latest post. :) I used Copics (another new love), hybrid scrapbooking paper, painting, rub-ons, alcohol ink, and stickers. The book I used was an old Reader's Digest book. To accommodate the added thickness of the pages, I ripped out some pages. My hubby is in Arizona for work, so he wasn't home again for the second year in a row to celebrate our anniversary. It's seventeen years today! I've been married almost half my life! Hubby is an amazing man. Very blessed to have a stable guy I can lean on, as I can get a little crazy! And love that quote! Anything C.S. Lewis is so very profound and deep. Had to include it. My living room wall above the sofa is getting a make-over. I put six empty canvases up, waiting to be decorated. Started by covering the whole canvas with gesso, then adding a light color wash for the background. Next, added texture to the background using different textured stuff like sponges and bubble wrap. Smooshed and pushed and shaped some (lots!) modelling paste into cabbage roses. It was hard getting the color right. We wanted a bright pink without it looking neonish or coral. I have had for years. And here's my sis's. Isn't it fabulous?!? I have been spending my spare time (and not-so-spare time) playing with Instagram. I just love this app for my phone! Anyways, I needed to come up with something scrapbooky, I just had to! 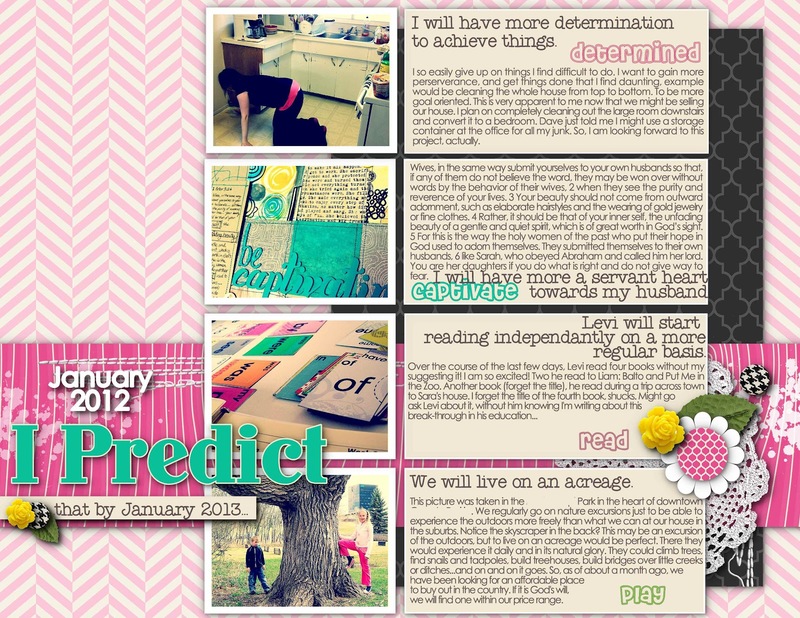 So, upon a little searching of Instagram ideas on Google and Pinterest, I happened upon Printsgram. 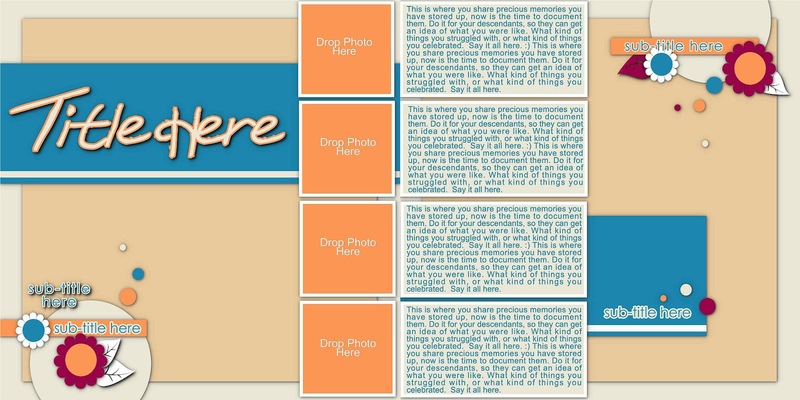 This fast, lightning quick little site allows you to print your Instagram pics, and I'm hooked! It's so easy! Here's some close-ups to get a feel for the texture and layers of the page. some luscious red flowery paper by Basic Grey: Konnichiwa. Hey, where did the "E" go in my title??!?!! Those are inked Basic Grey chipboard letters, by the way. The bannock was very tasty! We had a great time with these lovely friends! Hi all! How is your summer? I've been busy busy busy playing with Instagram instead of my templates! I'm so sorry if you were waiting for another one. But finally it's done. 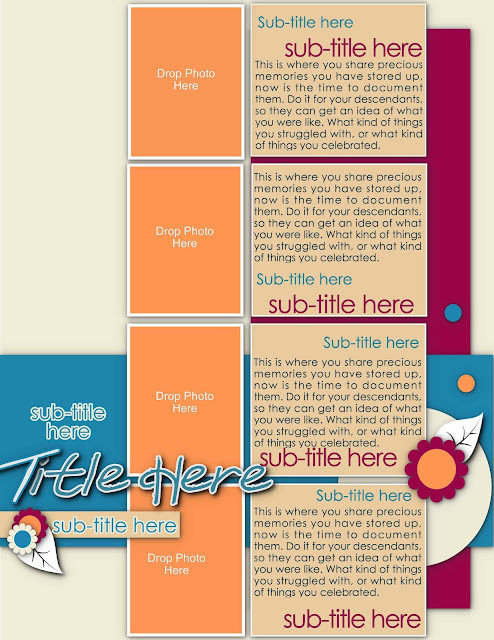 :) This newest template is actually a two-page version of the previous one. So, when you download it, you will get two SCRAP packages, instead of only the usual one. 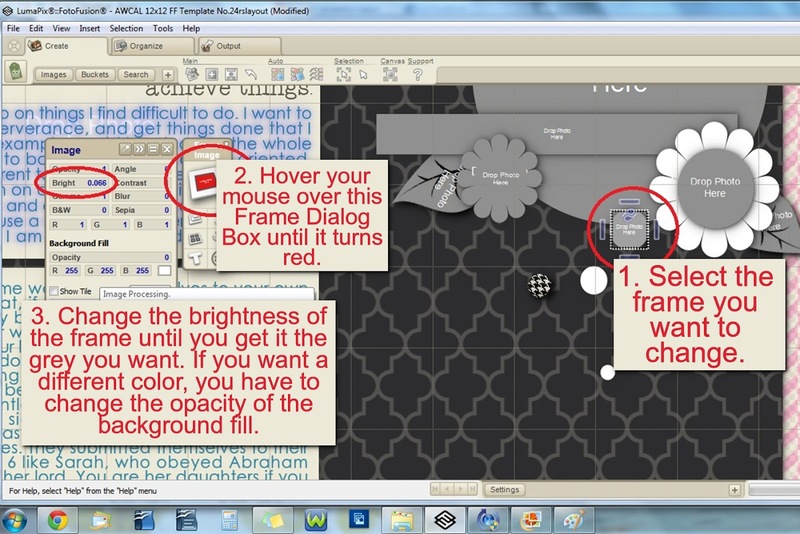 The following are some of the steps I took in creating the layout from the templates. First, a picture of the right side template. 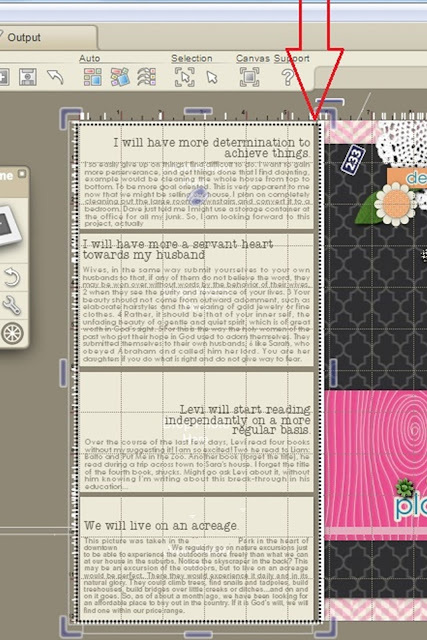 Lots of space for journaling, and a nice big spot to place a photo or to showcase patterned paper. ♦I removed the border on the frames. I felt the journaling would looked a bit trapped with them there. ♦To change the color of the space behind the text, I increased the opacity to 255, and then used the color picker to get the color I want. 2. Hover your mouse over the Frame Dialog Box and click when the image (little square) part becomes red. 3. Move the slider on the Opacity level of the Background Fill until it is 255. 4. Click on the little box right below the 255. 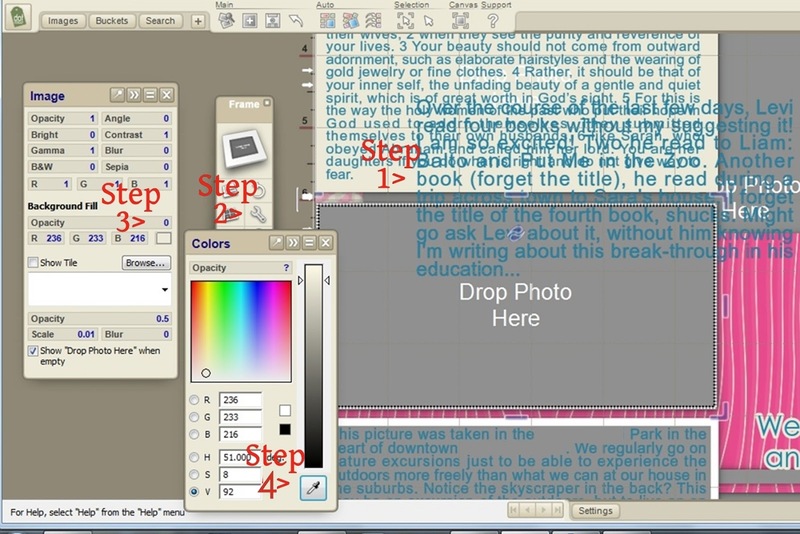 The color picker will appear as your cursor and make it hover over the color you want. I simply selected the cream right beside it. 5. Move the text back into place. ♦I change the sub-title: "We will live on an acreage", so that the right margin was lined up, instead of centered. ♦There are three little different-sized circles by that sub-title. I added flower embellishments on top of those circles, instead of dropping in paper. Got these cute little embellies from Sahlin Studio called Candy Flowers. So those circles in the template work well for proper placement of embellishments, if you find that you struggle to know where to place items. 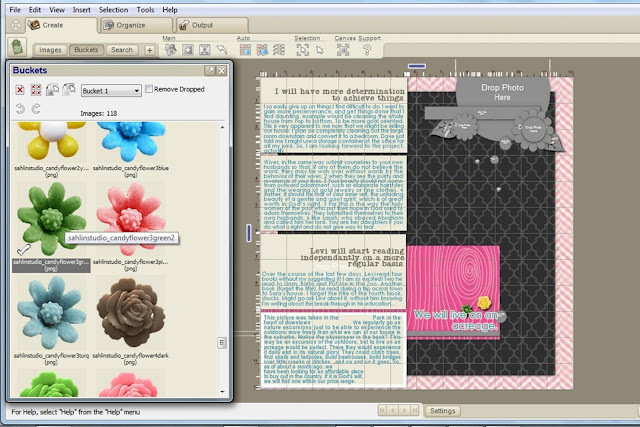 ♦I didn't want the shadowed flower embellishments to lie underneath the non-shadowed sub-title, so I selected the text>right-clicked and chose MOVE TO LAYER>selected COLLAGE. By default, FotoFusion is programmed the text to be always on top of everything else. 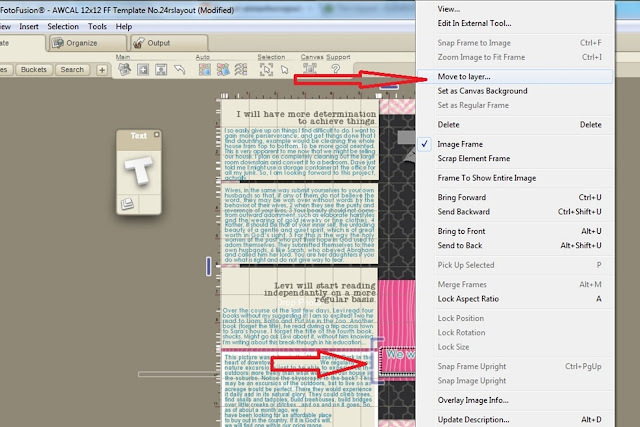 This changes the text to the same layer as the rest of the stuff on your page. ♦Next, I changed the flowers to white, and dropped in patterned paper for the flower middles. I changed the opacity of the background fill to 255, but you could also experiment: what color change would occur by simply changing the brightness of the main image. See picture below. ♦I "grounded" the journaling spots to the background by adding a brown and a white paper behind them. 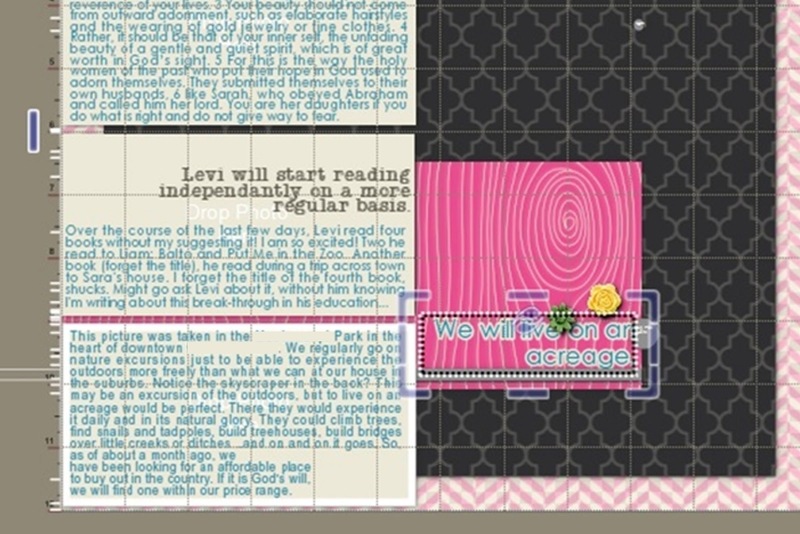 I also removed the shadow from each journaling block and made the top and bottom spots larger so there was no gap between the top and bottom of the page. Does that make any sense? And here's the finished page for the right side of the layout. ♦First thing, I dropped in the coordinating paper. ♦Added patterned paper to one flower circle and one little confetti circle. ♦Changed the color of the flower to white. ♦Substituted the leaves and some of the flowers from Sahlin Studio's Precocious Felt Leaves kit and from her Candy Flowers kit. ♦Added stitches by Anna Aspnes at O'Scraps. Made sure to remove the shadow, as it looks more realistic without. ♦Removed the shadow on the little strip of paper under the title. 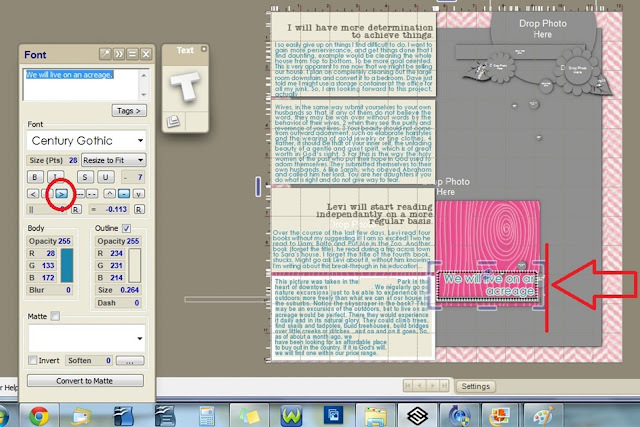 Used the color picker to coordinate the paper strips with the other papers. In the end, I put the two together to see how they would look side by side, and decided it looked too dark. So I switched patterns and changed the background color. I also made the top and bottom pictures go off the page, like I did with the journaling spots on the right side layout. I also widened the paper strip under the main title so that it reached the very edge. This is the end result: It looks a little busy, but sometimes I'm okay with that. :) To see larger, just click on the picture. Love doodling with markers sometimes. Got this question out of my Q&A book that I received as a gift. Please, pretty please, tell me. I would ♥heart♥ it! 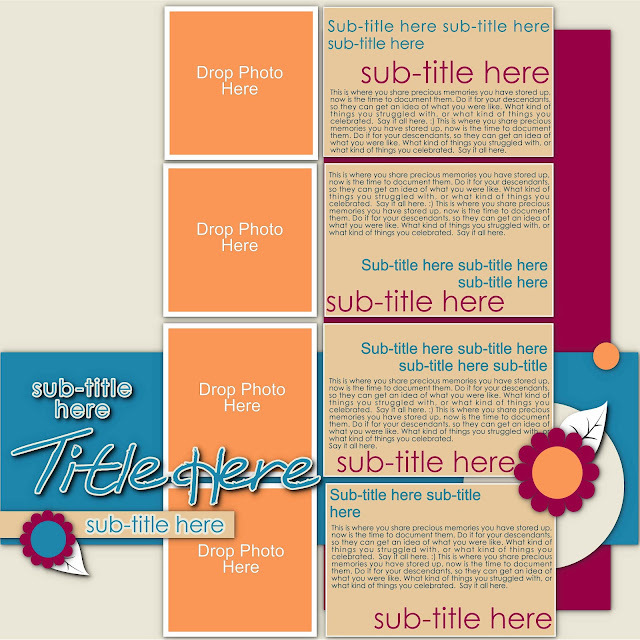 I've received requests for two-page layout templates, so that's what my next freebie will be. This is a two-page take on the previous layout, based on Amanda Probst's sketches. I'm really loving creating this! 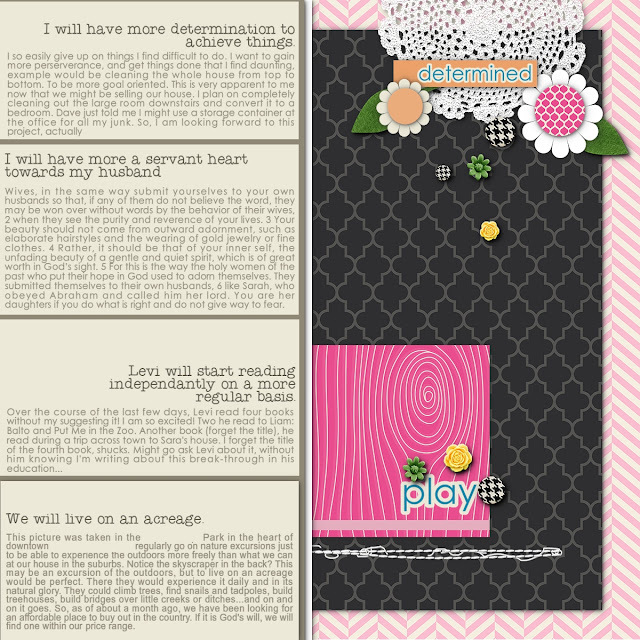 I am big into journaling, so this template will be perfect for those of you that like that as well, and, perhaps, it might inspire others to try journaling? You know, the text here is in paragraph form, but one could really just make lists of things, or phrases. Paragraphs can be daunting and scary, but making lists is easier. So, I dare you! You won't regret it! The template will be coming soon! Back in 2008, Amanda Probst wrote a monthly column in the Creating Keepsakes Magazine called Album in a Year. Every month she suggested a topic for you to scrapbook, capturing and documenting specific things every month. So, for January, she had you come up with predictions for January of the following year, and snapping photos or find some in your stash that would suit that topic. I was instantly hooked on the idea of creating one layout a month. For a (almost) complete list of her monthly topics, go here. 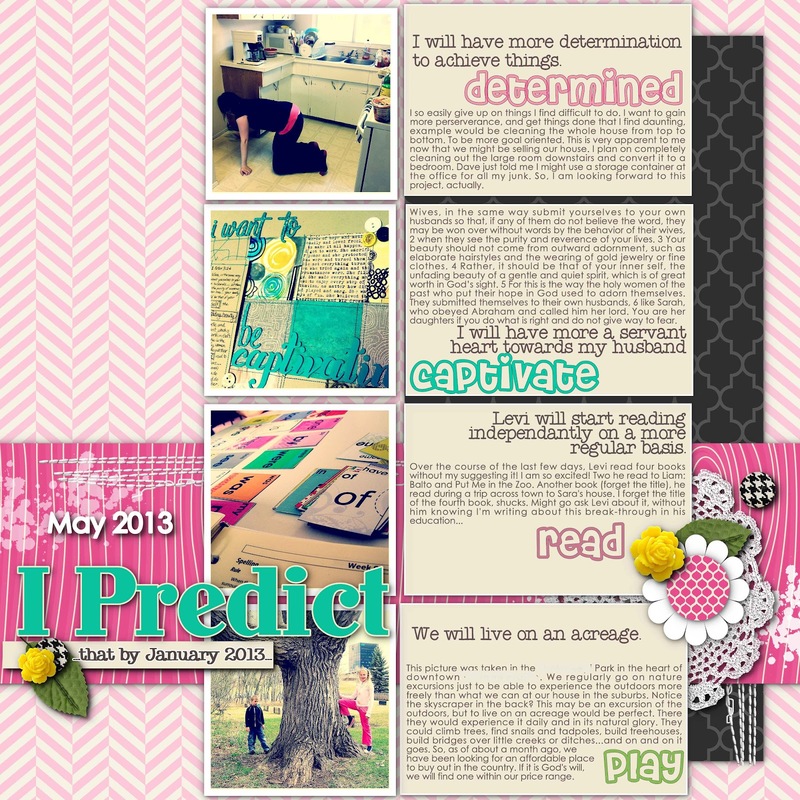 Prediction #1. determined: I will have more determination to achieve things. Okay, now writing this for my blog, it sounds a little vague and wordy. Sorry. :) Maybe more specifically, focus on my goals more? The photo is of me cleaning, cleaning, cleaning. I get bogged down easily when the task is unpleasant or hard or when I'm not sure how to do it... Maybe just a nice way of saying I'm lazy? :) I am not picky when it comes to cleanliness, so it's hard to be motivated. Prediction #2. captivate: I will have a more servant heart toward my husband. Like I mentioned earlier, cleaning, doing something for my husband that he really appreciates. I can be selfish, thinking of only my wants and needs, I want to love and respect my husband. Jesus my Saviour was King of Kings, but instead of wearing his royal robes, he chose a towel to show his love! I want inward beauty. See John 13:4 and 1 Peter 3:4 The photo is of a layout I made after being inspired by a lovely lady to be more captivating. I sewed and painted like crazy on this layout. I really like it. So, here is the preview of the template I created for this project, based on the sketches by Amanda. I made versions of the layout in 11x8.5 and 8.5x11 as well. Notice the small leaves? They are one of the mattes that FotoFusion has. I really like it! Love that you can color them whatever you want to. :) So, when you download the template, they will be included in the package automatically, but you won't need to keep the matte, since you will already have it. 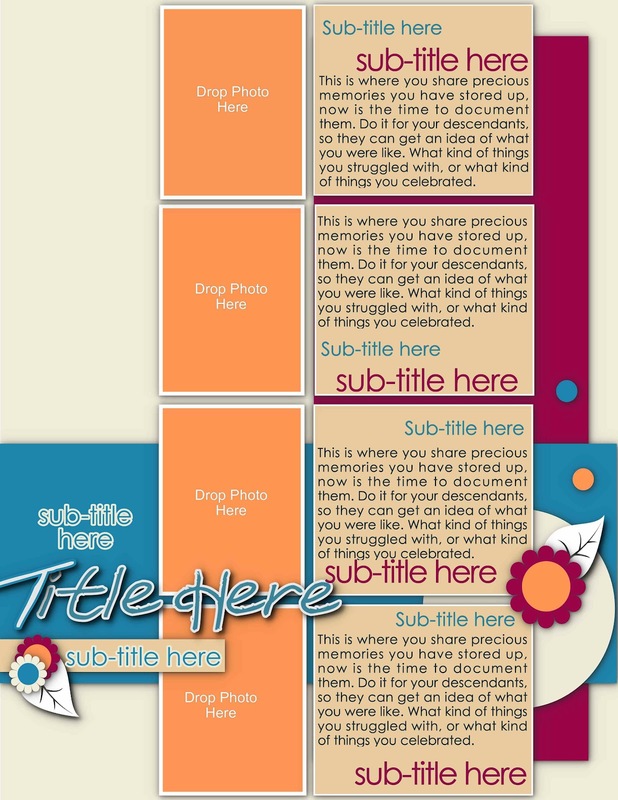 Note: These templates only work in FotoFusion, as they are .SCRAP files. 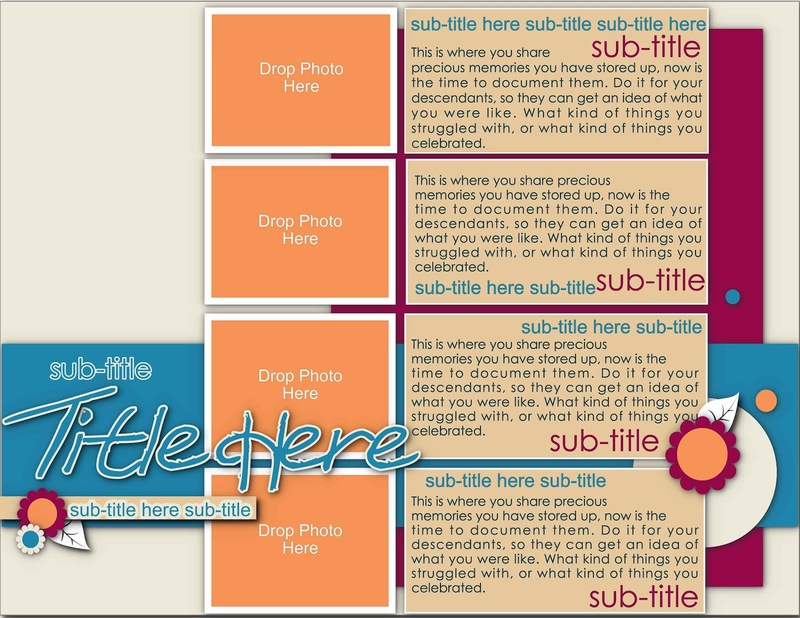 I had a great time making these templates, even though I did spend countless hours on them. LOL I am a crazy perfectionist when it comes to certain things. 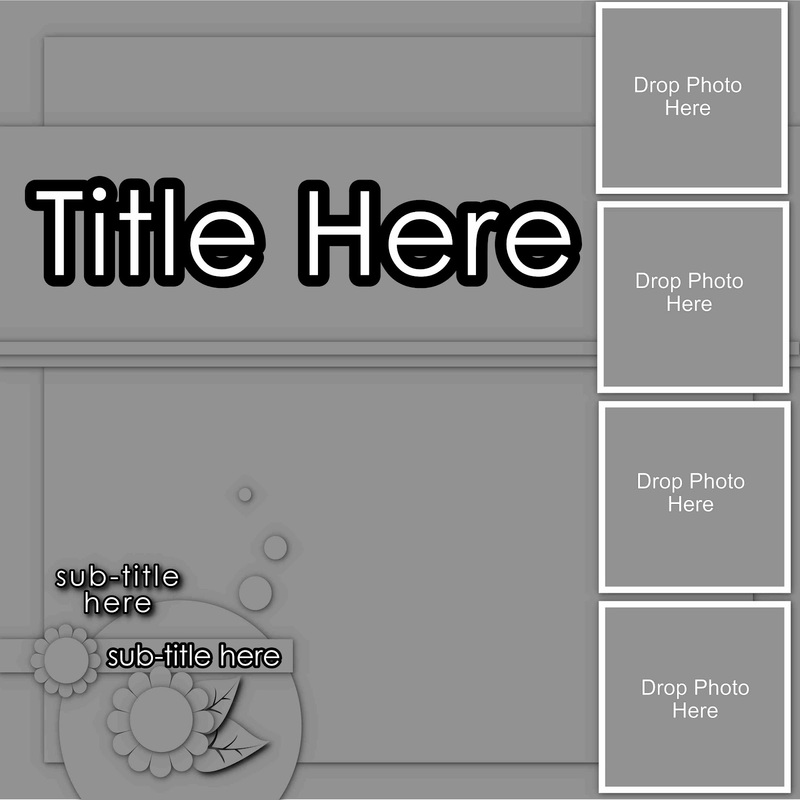 If you find a problem with these templates, please let me know, so I can fix it. Enjoy! Visit Anna Friesen's profile on Pinterest. Hello! Thanks for stopping by. I'm an artsy mama of three, a Christian who strives to glorify the Creator with the gifts He has given me. I'm always creating something, even if it's trying to come up with something interesting and tasty with leftovers for my always ravenously hungry family. I like to wander, I'm curious, a reader, a geek and sometimes even a nerd. 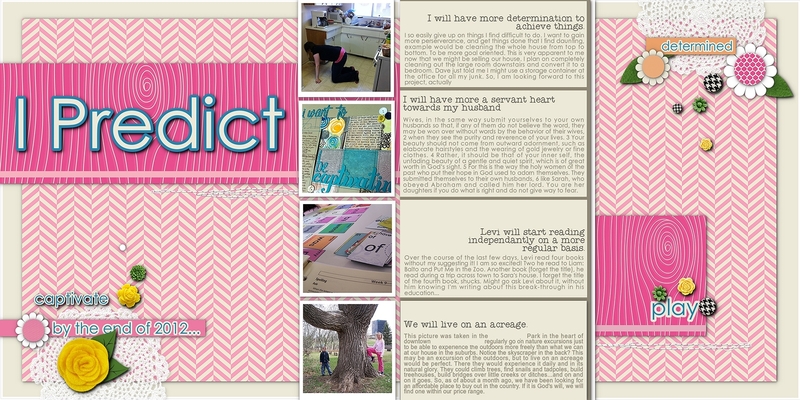 I just changed my blog name to Artful Stories, from Annawhocropsalot. Ahem. Yes. It was time. :) Please feel free to ask me questions here in the comments section or by emailing me at artfulstories(at)gmail(dot)com. Posts starting on February 2nd, 2015 and to the present: all artwork by me. "Annawhocropsalot" signature and Download Link design made by me. Signature "Annawhocropsalot" was made using letters by CD Muckoskey called SuzieQ.